The R. L. Barnes Map of 1868 is a rare map not seen often. I recently obtained a copy of the map from a friend. Barnes Map called the " Driving Map of Philadelphia and the Surroundings" is not very detailed but it shows you names you never hear anymore. For example "Wrangletown" the old name for Lima, named for the fights in the local tavern over 150 years ago. Click the above link for a look. 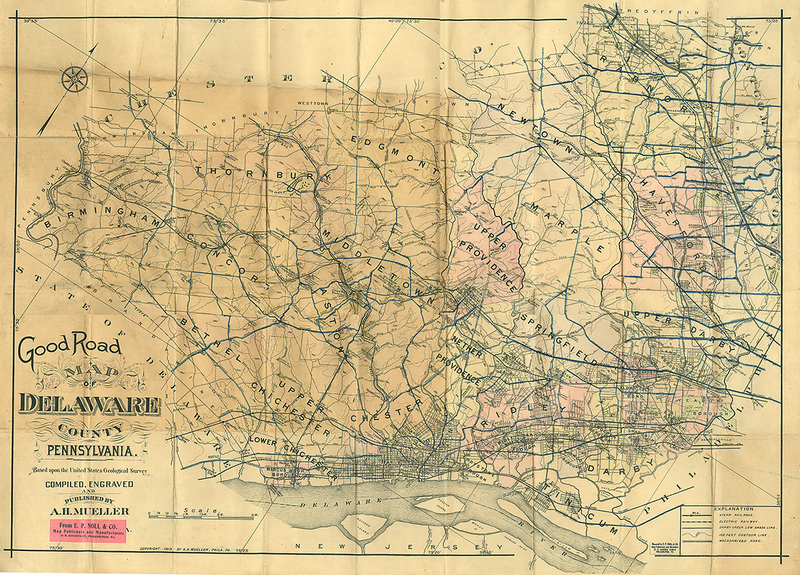 The George M. Hopkins 1870 Atlas is on this Site under the individual Township or Boro Page. The Atlas was reproduced for this Site in full color. 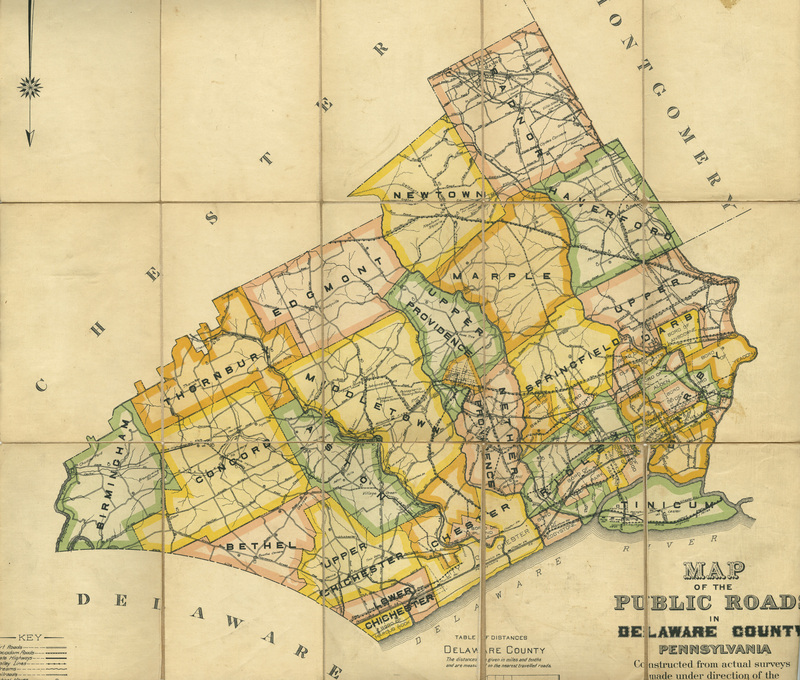 The 1870 Atlas is the first Atlas published of Delaware County. The 1875 Atlas of Evererts and Stewart was published just five years after the Hopkin's Atlas. 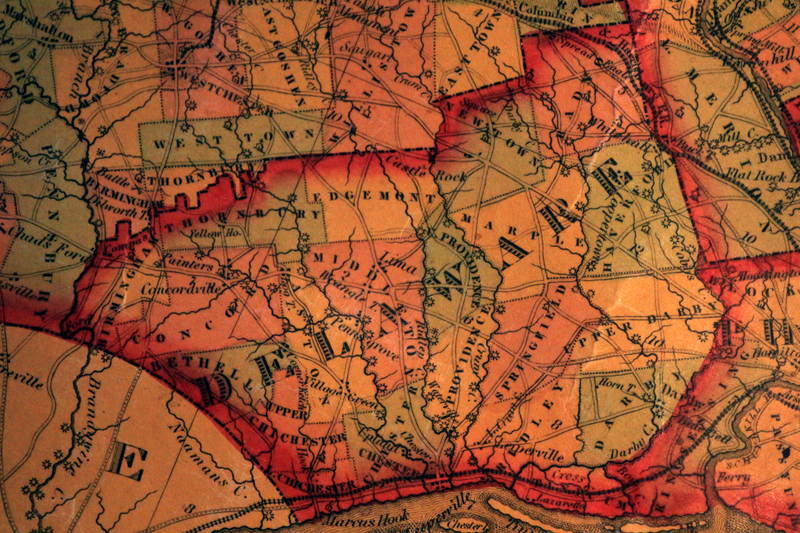 The Atlas reflected the changes that had occurred in the years from 1870 to 1875, with numerous towns being created do to railroad expansion. 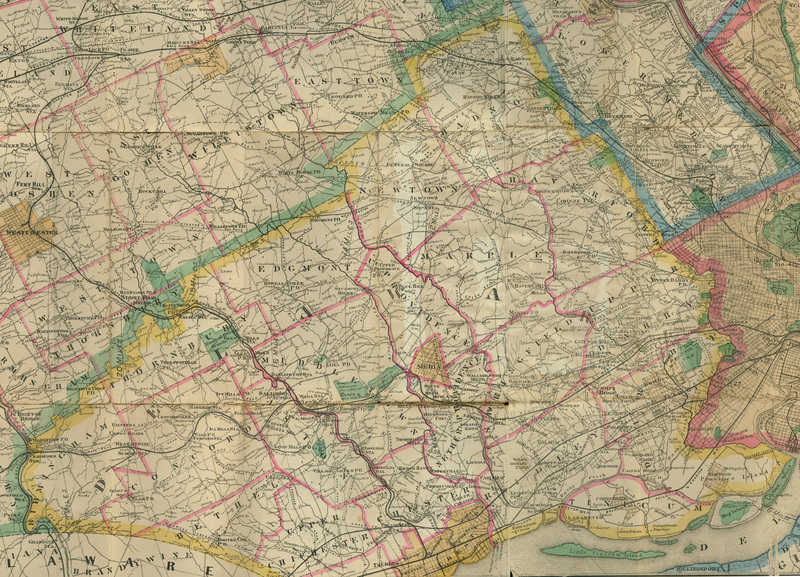 The 1875 Atlas Maps are on the site of the Township and Boros on this website. 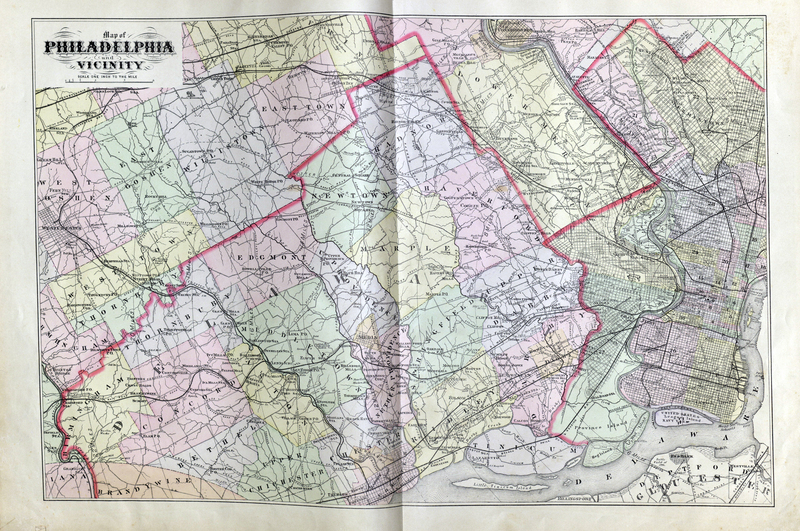 The Benjamin H. Smith Atlas of early Land Grants and Patents published in Philadelphia by Henry B. Ashmead is one of the rarest Atlas's of Delaware County, Pa. It is put on line here for the first time. Smith spent several years researching Land Grants of William Penn, his sons and others relating to what is now Delaware County. 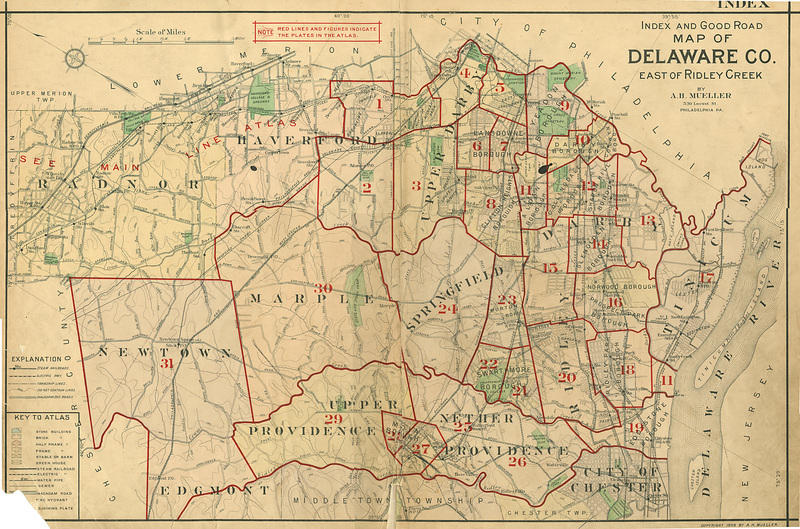 Delaware County was part of Chester County till 1789. The Maps can be found on their Township Web Page. 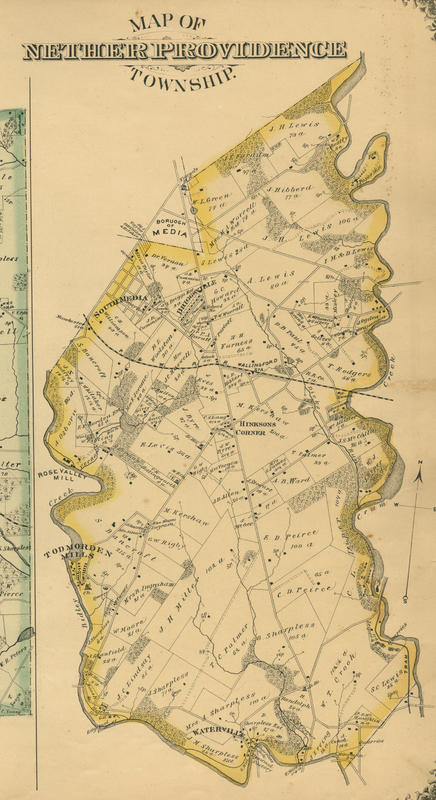 Farm Line and Borough Atlas of Delaware County, Pennsylvania Compiled from Dr. Ash's map of actual surveys, official records, private plans by William S. Miller, St. J. Ogier, William S. McDonald and Forsey Breau. Published by E. W. Smith and Company 17 & 19 South Sixth Street, Philadelphia, 1892. Pages unnumbered. The Miller Atlas is now complete and on the site. The Maps can be found on their Township and Boro Page. 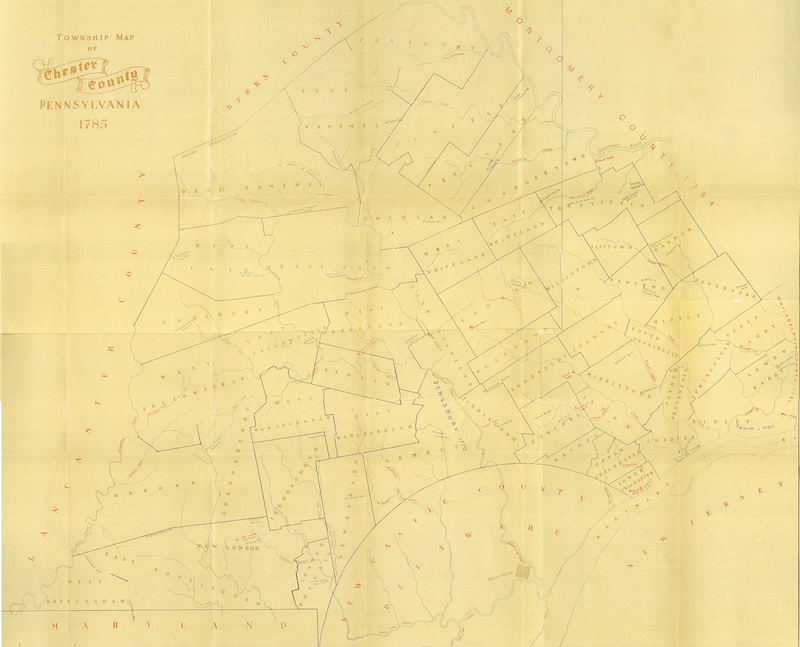 Baist's Atlas of Properties in Delaware County, Southwest Suburbs of Philadelphia. Complied from Official Records, private plans and actual surveys by George Wm. Baist, Surveyor and map publisher, 906 Walnut St., Philadelphia, Pa. 1902. 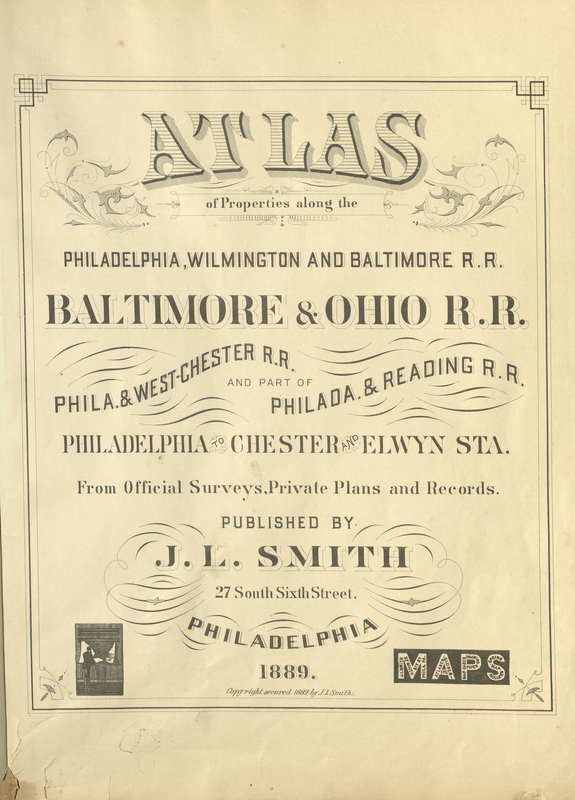 This Atlas is the rarest of all the commercial atlases made of Delaware County and very few exist today. The atlas only covered Delaware County southeast of Media. The Northeast Baist Atlas has been added too. Sanborn Atlases were originally made in the 1920's and rather than make a new atlas every year the company sent out updates in the form of paper which was cut and pasted on each page depending on new developments etc. Sanborn Atlases were large, the scale was an inch for a 100 feet. It is hard to tell with the Sanborns when they were last updated. Many of the atlases are not marked as to the exact year. They were used till the early 1960's. 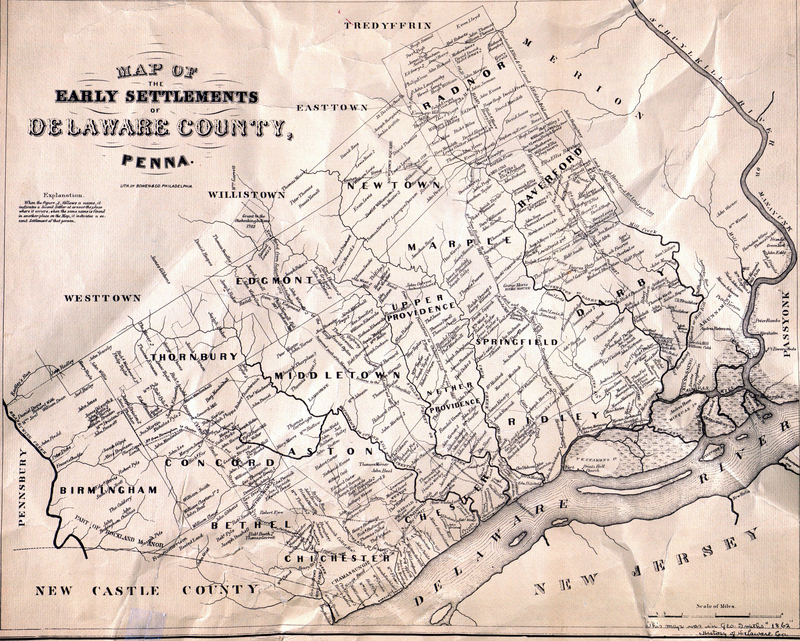 The above map from George Smith's History of Delaware County from 1862 is a nice one. Smith showed all the early settlers, where they lived and their land grants. This map is one of the earliest of the county. This map was published in 1875 for the nation's Centennial. The Map shows land grants, original Counties, purchases etc. It is quite detailed and takes a minute to load. This map does show the entire state and the many changes till 1875. You can see the map by clicking the above link. This map was done in 1785 of Chester County and shows what is now Delaware County. This Map did not reproduce well, but is here to give some idea of what Chester County once looked like. The Map shows some Churches and Mills. To see the Map click on the above link. J. L. Smith of 27 S. 6th St., Phila. published this map in 1889. The map shows all railroads and their properties east of Media. The railroads include the Baltimore & Ohio, Phila. and West Chester, Phila., Wilmington and Baltimore and Phila. and Reading Railroads. A rare atlas not often seen. The map above is from A.A. Mueller's Atlas of 1909. 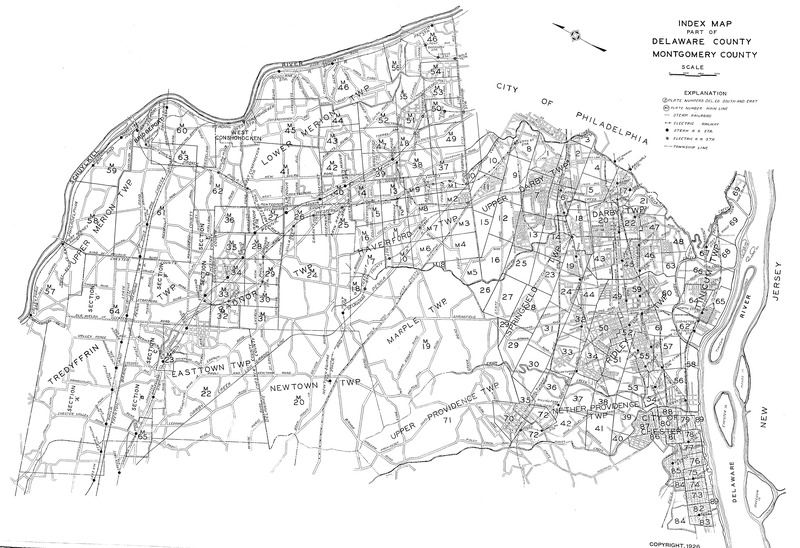 Mueller published three atlases of Delaware County. One in 1909 showing the East of Ridley Creek, 1911 the West side of Ridley Creek and 1913 his Main Line Atlas. The three are almost impossible to find today. The atlases are all in color and have great detail. The above map is from the front of the 1909 atlas. All maps can be found on the township and boro pages. The Public Map of 1913 was published for the then new Automobile Drivers in the area. You can see the map by clicking the link above. This rare atlas from 1928 covers Delaware County east of Springfield and Nether Providence Twps. It is very detailed with lot sizes and owners etc. The index is linked here the pages are on each Twp and Boro. This atlas was scanned in black and white and some pages are hard to read, but the pages blow up pretty well. This map published in the same year as the Public Road Map has much more detail. 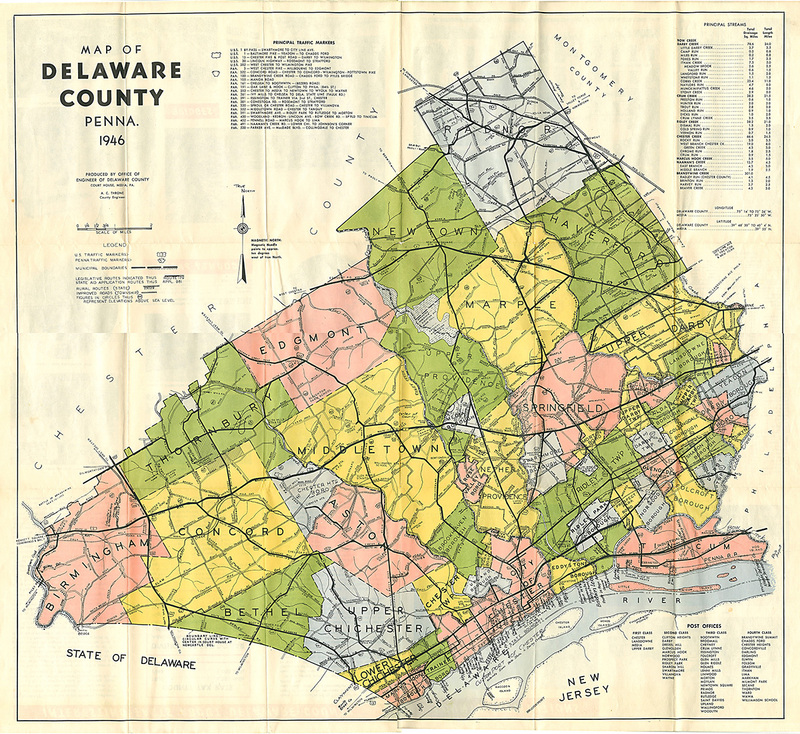 This County Map shows not only Delaware County but also the surrounding area. The date of the Map is unknown but it is about 1900. This color map shows Roads, Railroad Stations,Towns and some Businesses. The map can be seen by clicking the link above. This county above above is from the county and engineer, Arthur C. Throne who also has a bridge named for him in Folcroft. 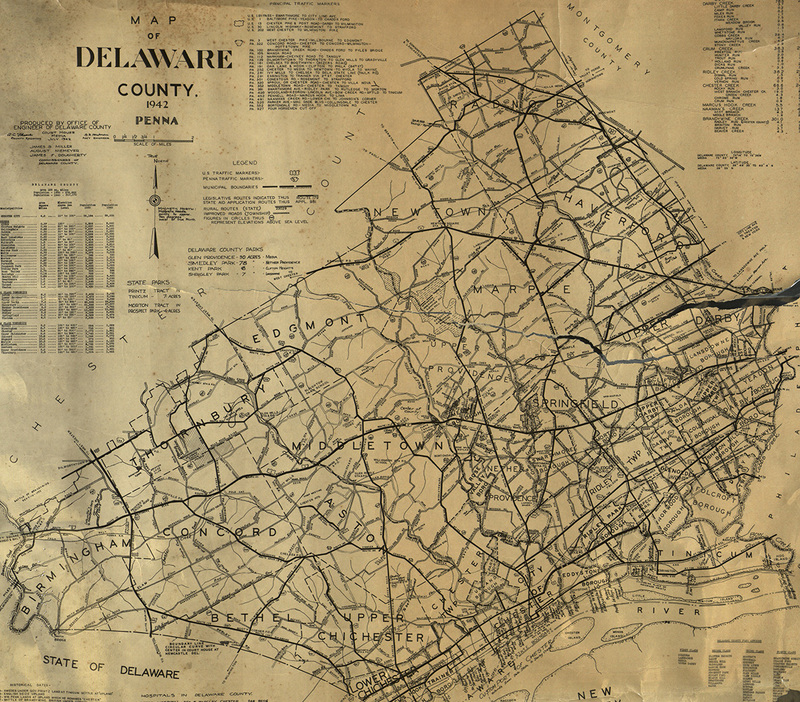 This map is one of the first maps published by Delaware County for it's residents. 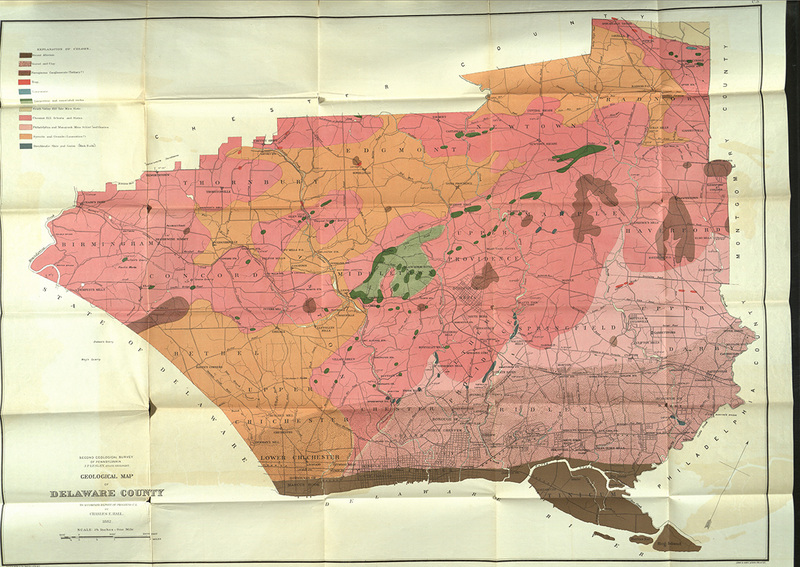 This map shows the townships and boros of the county and what historical resources they have and protect. 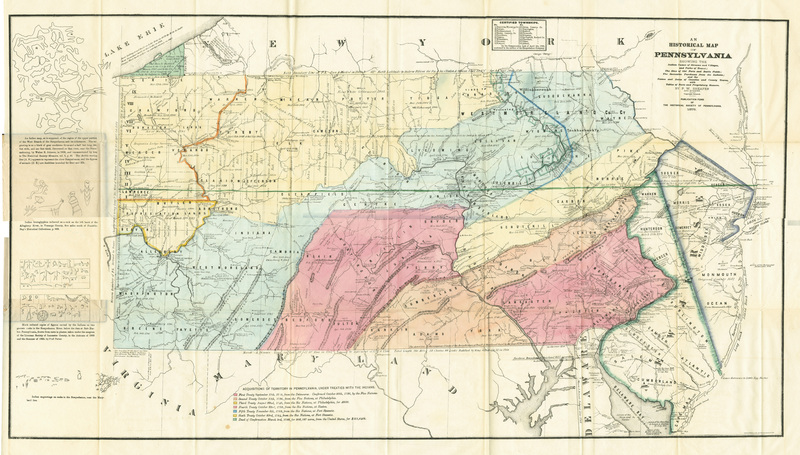 The Lower Merion Historical Society has some of the best maps and atlases on line. While most of them are of Montgomery County, some do cover parts of Radnor Township etc. in Delaware County. Well worth the look. Click on the link above and the link below. The above combination maps and aerial views shows a changing Delaware County and was used by real estate offices. Nice aerial pictures. This is a big file and will take time to download. Do you own old maps and would like to contribute to this site? Email Keith Lockhart Several people have contacted me about getting copies of township and borough maps from the web site. Copies can be made that look like the originals and can be framed. They can be done in color or in black and white. If you are interested in a certain map email me at the above address.